It is easy to find yourself in debt around the holiday times, with all the demands of family and friends. Stretching your budget to the limit and beyond. It is possible not to fall into this debt trap, because once you are in, it is difficult to find your way out again. This is because not only are you paying for the goods you bought but you are also paying the interest from the credit company too and this is high. It might seem impossible to come out the other side, but it will take hard work and a lot of commitment; it is easier not to fall into the holiday debt trap in the beginning. There are ways that you can manage your money in a way that allows you to spend the money that you can afford and not to go into debt. Budgeting sounds a tedious and boring task; it is essential if you want to live within your means. If during the year you have created your budget and set aside money for the holiday season then you will have a set amount you can spend on all things to do with the holiday, knowing that all the money you have can go on the gifts and the parties that you can afford. If you haven’t saved any money then all the gifts and parties that you want to attend will have to come out of the money you have left for the month. This could limit the amount of parties you attend or the presents you can buy. Talk to family members and friends, tell them you are changing the way you spend money and that you haven’t as much as you thought and you mightn’t be able to buy as many gifts or attend as many parties as you hoped, you’ll be surprised at how many people are fine with this. They too might want to reduce their spending but don’t know how to approach the subject. Make lists of the important items you need to buy and work out if you can afford them. It is important that if you haven’t got the money then you can’t buy the item; it is that simple and many people forget that credit is a too easy option but one that is difficult to escape from. If you tend to put more on your credit and debit card because you can’t resist a bargain, don’t take them with you, leave them at home and just take the cash to pay for the items that you do want. It is possible to do all your shopping online; it can be easier as you are not tempted with the other offers in store, sometimes you might find the item cheaper, but you do have to add in the delivery costs. If you find yourself in debt this holiday season, the best advice is to stop spending and take control of your finances. Know how much money you owe, this allows you to admit the situation. It is important that, if you don’t know what to do to get out of debt and you are unable to draw up a budget, you go and get help, speak to financial people from the Citizen Advice Bureau. They will be able to help to discuss the situation and what steps you need to take. If you are in debt it is important that you don’t go to companies that charge you money to sort out your debt, get free advice and understand what you can do to help yourself. 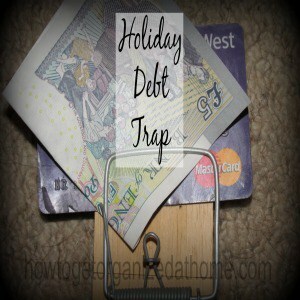 Therefore, if you want to avoid the holiday debt trap it is important that you spend the money that you can afford. If you find that you have debt and want a way out seek the help and support that you need.